JS Thomas Service, Inc. has been meeting the HVAC needs of Atlanta area business, industrial and other commercial facilities for more than 35 years. We offer top quality commercial HVAC maintenance, repair, service, and installation with unsurpassed personal service. 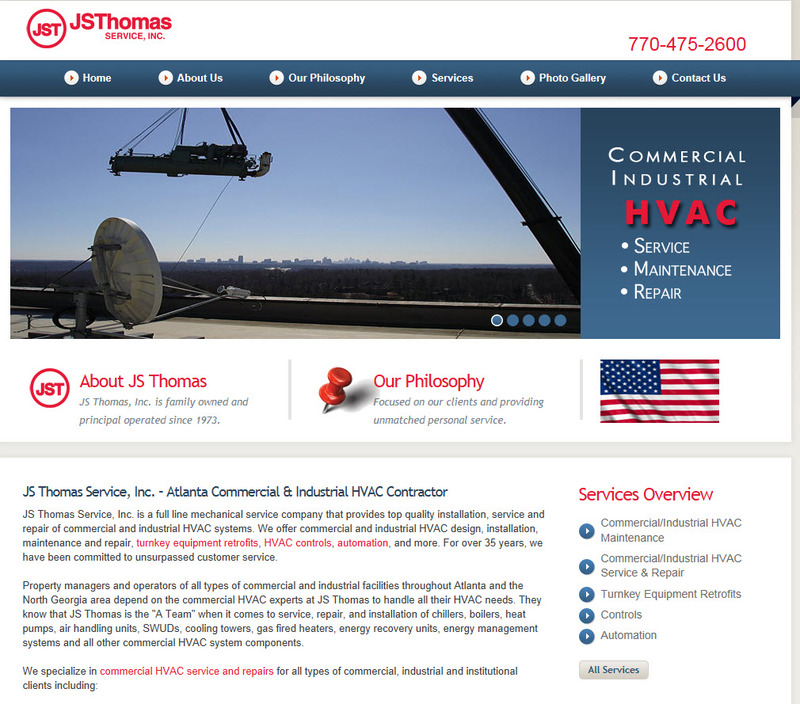 At JS Thomas Service, Inc., we have earned our reputation as one of the leading Atlanta commercial HVAC contractors by focusing exclusively on commercial and industrial HVAC service, repair and installation. Unlike some of our competitors who handle residential and commercial HVAC, we specialize in commercial HVAC and we do it better than anyone else because we understand and cater to the needs of commercial clients. JS Thomas Service, Inc. offers a complete range of commercial and industrial HVAC maintenance, service and repairs. We can handle all types of repairs and maintenance on an as-needed basis, but we recommend a customized maintenance plan to minimize costs, reduce unexpected breakdowns, and maximize the efficiency and service life of your equipment. All of our licensed technicians have many years of commercial HVAC experience. We only hire experienced commercial HVAC technicians and ensure they stay up to date with the latest developments in the industry with regular training including factory training from Trane, Carrier, Liebert, York, and other major manufacturers. You can be confident that only the best, most knowledgeable technicians are working on your heating, ventilation, and cooling systems. We know that downtime costs you money and we are available around the clock seven days a week to handle emergencies whenever they arise. We personally answer the phones so you will never have to leave a message or wait for a call back. We shoot for a response time of less than two hours and stand behind our work with a guarantee of your complete satisfaction. When only the best Atlanta commercial HVAC contractors will do, call JS Thomas Service, Inc. today. JS Thomas Service, Inc. provides top quality commercial HVAC services to businesses in Alpharetta, Atlanta, Duluth, Marietta and the surrounding areas.